N.B. — This blog is a major excerpt from the article entitled “Healthcare transformation using innovative information technology,” authored by me as my former role as President & CEO, CHARTSaaS.org with Dorothy L. Pennachio, former Member, CHARTSaaS.org Professional Advisory Board, and published on November 18, 2016 in Becker’s Health IT and CIO Review © Copyright ASC COMMUNICATIONS 2016 (http://www.beckershospitalreview.com/healthcare-information-technology/healthcare-transformation-using-innovative-information-technology.html). Prompted by a recent New England Journal of Medicine (NEJM) Perspective article describing healthcare transformation,1 and motivated by a recent study identifying medical mistakes as the third leading cause of death in the United States of America,2 CHARTSaaS.org, a United States not-for-profit corporation (www.chartsaas.org), posits that now is the time to recognize and to act on the unique potential of state-of-the-art information technology (IT), innovatively employed, to effect the optimization of medical practice and healthcare delivery in a manner that will mitigate medical mistakes and save patient lives. This IT-enabled optimization of healthcare provider practices can be accomplished by minimizing the arguably root cause of patient adverse events – cognitive overload. Consistent with the call previously published in NEJM3 to adopt an “… IT foundation required for health care … [including] the core set of health data types, the formalization of health care workflows, and encoded knowledge (e.g., practice guidelines, decision-support tools, and care plans);” we propose a low-cost and minimally complex approach for implementing the required “IT foundation for health care” to realize the customized clinical cognitive support on which the long-overdue positive transformation of healthcare depends. The recommended IT cognitive support is specified by the Cloud Healthcare Appliance Real-Time Solution as a Service Reference Architecture (CHARTSaaS RA), which describes the IT hardware and software components, configuration and capabilities required for providers to create customized applications, a.k.a. apps, with minimal cost and complexity. Human cognitive capability can be visualized as a rapidly recurring cycle of four specific information-centric activities: first, information acquisition, including constant monitoring and complex event analysis; second, information assessment, including evidence-based case record and other unstructured content similarity searching and predictive analytics; third, information application, including decision-making in the context of purpose-specific process execution; and fourth, information adaptation, including results analysis and knowledge development as the basis for process modification and re-execution. This cycle is a feedback loop; whereby the acquired and assessed information is applied to some activity or circumstance, and then the results are interpreted and applied to the activity as/if indicated for continuous process improvement. 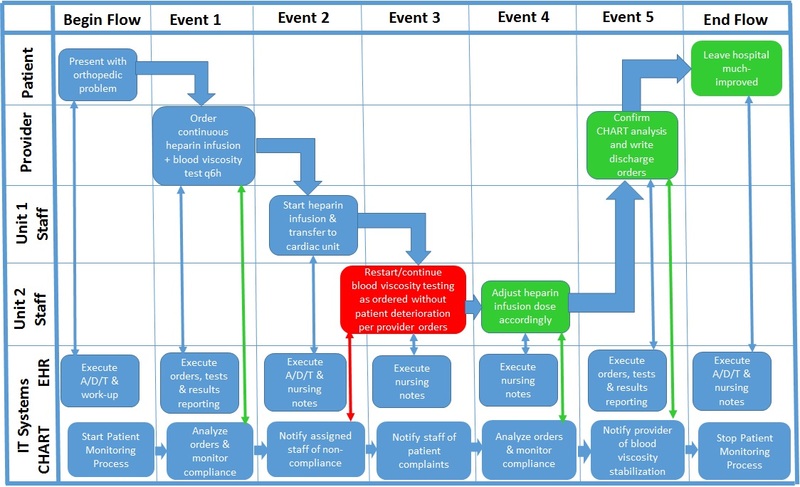 However, concurrent operation of the cognitive capability cycle for many processes for many patients on a continuing basis without error exceeds the cognitive capacity of a clinician and even a clinical care delivery team; which creates the risk of medical mistakes and consequent patient adverse events (PAEs). Nevertheless, zero-defect recurring and concurrent operation of these activities and tasks in the context of continuously operating processes are well within the capability of IT systems, provided that the hardware and software components are appropriately architected and accessible. In fact, such a configuration of computer capabilities could not only ensure reproducible recurrence of error-free processes but also accelerate stochastic optimization to create a kind of self-learning capability, a.k.a. artificial intelligence, to accelerate the accrual and application of new knowledge. These dynamics in turn would facilitate and accelerate the progression from the iterative/experimental mode of treatment for poorly understood pathologies such as forms of cancer to sequential/prescriptive mode of treatment for well-understood pathologies such as Type II Diabetes, as described by Dr. Bohmer5, the author of the Perspective article cited above. The computerized capability configuration needed for medical mistake mitigation is described by IT analyst firms6 as a low-/no-code intelligent business process management suite (iBPMS, which may be thought of as a software development kit, a.k.a. SDK), and is marketed as of this writing by an increasing number of independent software vendors (ISVs). An iBPMS is well-suited to hands-on use by healthcare provider subject matter experts with minimal IT professional staff assistance, because the typical mode of user interaction is via non programing/coding methods such as “drag and drop.” In addition, the iBPMS must operate on an IT platform in the “Cloud” (i.e. – a professionally managed data center accessible via the Internet) that complies with the Health Insurance Portability and Accountability Act (HIPAA) Administrative Simplification Privacy and Security Rules/Regulations and other domestic and international governing laws, regulations and standards; which platform is offered as of this writing by only a few cloud service providers (CSPs). Although the healthcare-oriented CSPs and cloud-based iBPMS represent a niche market and a state-of-the-art IT solution, nevertheless they are well-understood and widely used successfully in several industries other than healthcare globally. Please contact me, Pete Melrose, at 001-612-201-2301 or jpetermelrose@gmail.com, to discuss and decide re the implementation of a CHARTSaaS RA-compliant solution by your healthcare provider organization to relieve cognitive overload, which is arguably the root cause of medical mistakes, currently the third leading cause of patient deaths (re http://www.bmj.com/content/353/bmj.i2139). 1 Bohmer RMJ. Perspective: The Hard Work of Health Care Transformation. N Engl J Med 2016;375:709-711. 2 Makary MA, Daniel M. Medical error—the third leading cause of death in the US. BMJ 2016;353:i2139 (http://www.bmj.com/content/353/bmj.i2139). 3 Mandl KD, Kohane IS. Escaping the EHR Trap — The Future of Health IT. N Engl J Med 2012; 366:2240-2242. 4 For example: Croskerry P. Diagnostic Failure: A Cognitive and Affective Approach appearing in Advances in Patient Safety: From Research to Implementation (Volume 2: Concepts and Methodology) Henriksen K, Battles JB, Marks ES, et al., editors, Rockville (MD) Agency for Healthcare Research and Quality (US); 2005 Feb.; and Groopman J. How Doctors Think. Houghton Mifflin Harcourt (New York, NY, 2008). 5 Bohmer RMJ. Designing Care – Aligning the Nature and Management of Health Care. Harvard Business Press (Boston, MA, 2009), pp. 105-107, 128-133. 6 Dunie R et al. Quadrant for Intelligent Business Process Management Suites. Gartner 18 August 2016 ID: G00276892 (http://www.gartner.com/doc/reprints?id=1-3F1C5YC&ct=160817&st=sb, viewed on 10/10/2016); and Rymer JR et al. The Forrester Wave™: Low-code Development Platforms, Q2 2016. Forrester 14 April 2016 (http://reprints.forrester.com/#/assets/2/85/%27RES117623%27/reports, viewed on 10/11/2016).